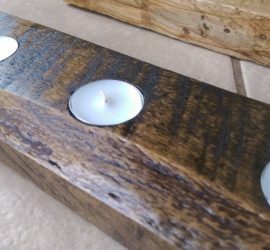 Create a Tealight Candle holder from reclaimed pallet wood. This is a a simple project that features a small amount of wood work and a good opportunity to practice finishing techniques. The end product is a nice centerpiece for a long table or fireplace mantle.